The painful experience of being stranded for long hours by foggy weather in Hainan last winter may be much less likely to happen this year as efforts have been made to ensure the smooth flow of tourists during the upcoming Spring Festival holiday. "The new facilities, the first of their kind installed in China to watch for sea fog, will help improve precise monitoring of fog conditions over the Qiongzhou Strait, a crucial 29.5-kilometer-wide channel that links Guangdong with Hainan," said Cai Qinbo, director of Haikou Meteorological Observatory. Others include faster loading of ships, more parking lots, more safety inspections and a compensation policy for shipping companies across the strait. "An emergency leadership group has been established, formed by 29 provincial government departments, institutions and major transport companies," said Lin. Heavy fog lasted for seven days during the last spring festival holiday, the longest of its kind since 1951, stranding more than 100,000 tourists. The rare long heavy fog shrouded the strait and blocked normal shipping service for 68 hours at intervals, backing up traffic for more than 20 km in Haikou and causing waits of more than two days before the cars were loaded onto ships for home on the mainland. Though the provincial and Haikou city governments, public sectors and thousands of individual volunteers provided generous and warm support to the stranded holiday makers with free food, clothes, medicine and even tents, last year's experience made many people, especially those who drove to the island, have second thoughts about another holiday on the island. Weather forecasts show that the weather is becoming more favorable this year. "The latest 10-day forecast showed the Qiongzhou Strait will have fewer foggy days and strong winds. The navigation and meteorological conditions will be better than last year," said Cai. Officials with the Haikou port authorities said that starting Feb 6, a reservation system will be working for drivers leaving Hainan Island. Six screening facilities have been installed and in two seconds people can pass through the check and drive their cars onto ships. In addition, the Civil Aviation Administration of China will make the Haikou Meilan International Airport a test ground this year to open red-eye flight services from Feb 9 to 24 to provide visitors richer travel experiences and more economical air services. From Jan 20 to March 1, a total of around 37,000 flights will land and depart from Meilan International Airport and Sanya Phoenix International Airport, transporting about 6.3 million passengers, according to the local airport authorities. 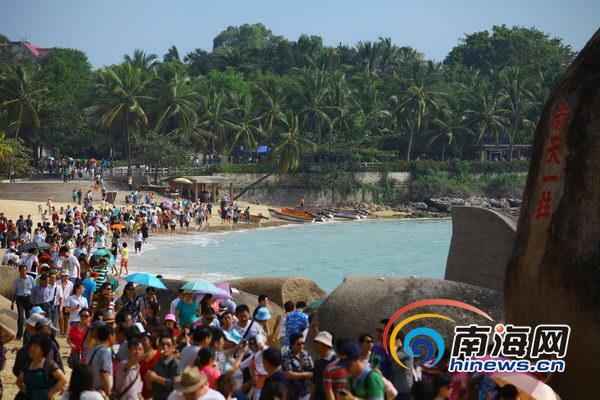 In the last Spring Festival holiday, Hainan, a popular destination for Chinese tourists during the Lunar New Year holiday, received 5.67 million tourists and more than 92,000 cars, according to data from the provincial tourism development commission.